Call 828-692-0100 or email to reserve your spot! You MUST SIGN UP for these programs to participate. Category II, III NC EE certification and CEU credit available upon request. These programs are FREE but you MUST SIGN UP to participate! Join NC Forest Rangers for an moderate, ¾ mile hike to observe and identify early spring wildflowers. Hiking through this diverse forest ecosystem we are likely to see plenty of Violets, Trout Lilies, Trillium and more! The program is limited to 20 people but if there is enough interest another hike may be offered. We will meet near the main kiosk in the parking lot at 10am. We recommend bringing comfortable shoes, a water bottle, a camera, and a wildflower field guide if you have one. Join NC Forest Rangers for an moderate, ¾ mile hike to observe and identify early spring wildflowers. Hiking through this diverse forest ecosystem we are likely to see plenty of Trillium, Flame Azalea, Spice Bush and more! The program is limited to 20 people but if there is enough interest another hike may be offered. We will meet near the main kiosk in the parking lot at 10am. We recommend bringing comfortable shoes, a water bottle, a camera, and a wildflower field guide if you have one. Join professional birder Kevin Burke for a birding exploration of Holmes Educational State Forest. Kevin has been birding for 17 years and uses his expertise to guide trips in North Carolina, Tennessee, Washington, Idaho, and Oregon. Most recently Kevin has led trips to Columbia and Portugal. On this hike we can expect to see/hear warblers (such as Ovenbird, Black-throated Green Warbler, Hooded Warbler, Louisiana Waterthrush, and Northern Parula), tanagers (Scarlet) and vireos (Red-eyed and Blue-headed) among others. This program is free but you MUST SIGN UP for this program to participate. Call now (828 692-0100) or email holmesesf.ncfs@ncagr.gov to reserve your spot! Program is limited to 15 participants. The group will meet in our main parking area at the kiosk. It is recommended that you bring comfortable shoes, a water bottle, camera, and bird field guide if you have one. The hike is set to end at 11am but feel free to explore the rest of Holmes Educational State Forest on your own time. We offer hiking trails, picnic areas, and a variety of educational exhibits. 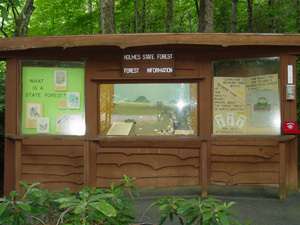 There is much more at Holmes Educational State Forest to explore on your own time! We offer hiking trails, picnic areas, and a variety of educational exhibits.